Common octopus. Photo by Francesco Turano. Photography has helped me to document the life of an octopus, immortalizing many aspects of this creature’s behavior in pictures: its poses, its liveries, its ways of doing things. Always fascinated, I observe the octopus with an awareness that appreciates every single attitude, every little nuance of its way of being—a magic cephalopod, indeed! Among the living molluscs, cephalopods are certainly the most evolved. Literally, “cephalopod” means "with the feet on the head" (from “kepahalè,” meaning “head”; and “podus,” meaning “foot”). It is a name well-suited for these sea creatures, born with arms (or tentacles) that are directly attached to the head. Of all the cephalopods, the octopus is definitely the most well-known. However, it is always difficult to talk about one of the best-known sea creatures without falling into the banal. I will therefore try to use my human brain, squeezing it properly, just like the octopus itself, which is among the most intelligent invertebrates in nature. What draws me to the figure of this animal is its unique and unmistakable appearance, combined with its formidable and endearing nature. I am talking about an emotional bond between a sea lover and a sea creature, a profound link between a person and an animal, which often represents one of the great joys of life. In my native Italy, the octopus is called polipo (or “polyp”), despite that in Italian, the term indicates the fixed stage of coelenterates (red coral, anemones, etc). This cephalopod lives in coastal areas on the sea bottom—whether it be rocks, sand or reef—up to a depth of about 100m. On the menus of many Italian restaurants, we often see dishes called insalata di polipo (or "polyp salad"). This demonstrates that the correct term still has difficulty getting into common use. Its scientific name is Octopus vulgaris, which means roughly "common octopus." Eight is indeed the number of its long limbs, arms or tentacles. A substantially solitary animal, very tied to its territory, the octopus makes small seasonal migrations in response to temperature variations. However, it is inactive at temperatures below 7°C (45°F). Adults move to deeper waters at the beginning of autumn, followed later by younger individuals. Octopuses are invertebrates with separate sexes, the male octopus being greater in size than the female. The male has a specialized arm, called a hectocotylus, modified at the end in a sort of spatula shape, which has a reproductive function: It is used to introduce sperm contained in bags (called "spermatophores") into the female’s body. The octopus’s reproductive period takes place in the spring. The females produce from 50,000 to 100,000 eggs, each about 2mm in diameter. They deposit the eggs in gelatinous cords, which attach to solid supports. Upon hatching, the larvae are pelagic, and only after 40 days do they make contact with the bottom. I have often seen an octopus with eggs, intent on brooding inside its burrow. It is an unparalleled spectacle, seeing this creature assisting its young—at once incredulous and extraordinary. The female does not feed while waiting for her eggs to hatch. She defends her eggs strenuously, does not move from her place, and is willing to give up her life for her offspring. How many things nature teaches us! But what does our dear friend feed on? The octopus’s diet is mainly composed of bivalve molluscs and crustaceans, even if the animal does not disdain fish and other prey—it adapts well to the strangest situations. With an oval, globe-like body, almost the shape of a sack, it has a head and a body, which is both robust and muscular, fused in a unique structure called a mantle, which is clearly distinguishable by an evident narrowing. On the sides of the head, which is the strongest part of this animal, are its protruding eyes, which are small, placed laterally and surmounted by two protuberances. The lively and restless behavior of this bizarre cephalopod is linked to the possession of these visual organs. In the back part of the mantle, there are seven to 11 gill lamellae (not visible from the outside) and a siphon from which water is violently expelled for different purposes: moving or swimming quickly and, in case of danger, expelling the contents of the gland ink. This pocket contains a dark substance that muddies the water, disorienting the assailant and allowing the octopus to escape undisturbed. Thanks to the siphons and its extraordinary system of locomotion, the octopus can suddenly rise from the bottom like lightning and swims like no other animal species. In reality, there are very few times that an octopus will swim, and when it does, it makes short trips so it can rest on the bottom again, hiding itself with its unbeatable camouflage. 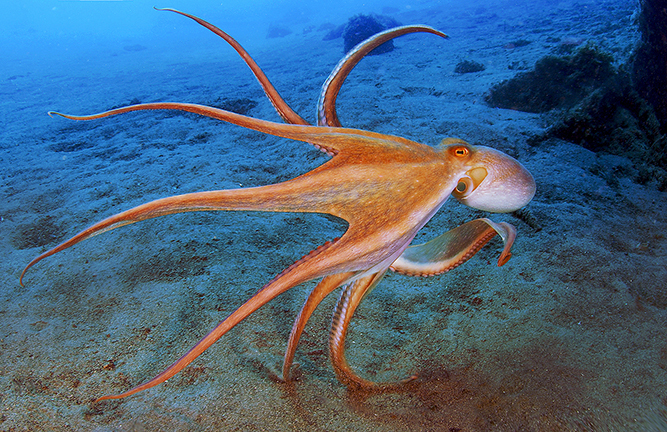 However, it is a very modern propulsion system that the octopus employs—a jet engine, if you will, that launches water against water, advancing the animal forward in jerking steps, making the bag that is its head throb, as it opens and closes its arms, which begin to look a bit like long flowing locks of hair. From the mantle of the octopus, eight tentacles extend, equipped with two rows of suckers, radiated and without denticles. The suckers are used to retain prey, and as mentioned above, to move on the sea bottom, allowing the octopus to attach itself to the substrate. At the center of the crown of tentacles is its mouth, with a robust horny beak similar in shape to that of a parrot. The octopus' tentacles are more or less of the same length, except for the male’s modified arm (or "hectocotylus"), which is about 25 percent longer. Master in the art of mimicry, this mollusk can change color through specialized cells called chromatophores, which are used for the transmission of signals (in courtship, coupling and fighting) and to blend in with the environment. The coloring of the body takes different shades, ranging from gray to brown, with reddish or greenish spots—while the ventral surface is whitish and iridescent. The colors of the octopus do not change only in relation to the external environment, but they even manifest the animal’s mood. On its skin, there are sometimes different colors, and also different structures, ranging from smooth to grainy, from swollen to warty. Underwater, everything is different if you surprise an octopus in its den or when it is free outside on the sea bottom. Its appearance varies greatly depending on the situation. An octopus in a burrow moves little if it feels safe within its shelter, but it will swell a little if it perceives a threat, showing its bigger suckers and withdrawing within its cave, if necessary. An octopus running around the sea bottom, if surprised, at first tries to blend in a way that best suits it. When it realizes that a diver's gaze has not released it, the octopus bleaches and starts to move sideways cautiously, gaining ground towards its den. In some cases, it gets up and swims to get away first, but then it rests on the bottom and, if it detects the diver is still nearby, the octopus can also resort to the use of black ink to confuse the opponent. Regarding the size of octopuses, legends aside, the maximum length reached by an octopus is about one meter or so, and its weight rarely exceeds 10 to 12kg. Habitual frequenters of fissures between rocks, octopuses barricade themselves in their dens with stones, empty shells and other objects found on the sea bottom. While not disdaining areas of mixed substrate, octopuses can also be found on sandy and muddy sea floors. In these environments, the octopus builds its burrow by collecting stones and shells and digging a sort of hole on the sea bottom, which is easily identifiable. The entrance of the den, in general, is recognizable even in cliff environments due to the presence of the numerous remains of prey upon which it feeds (shells of bivalves, carapaces of crabs and much, much more). What a thrill it is to see an octopus swimming in the sea, while frantically trying to follow it in order to photograph it as it moves along on its tentacles; and then, when it stops, lost, in front of a diver observing it, to watch the octopus suddenly push against the sea floor, opening its arms up, almost like a parachute, just as it hears the diver’s exhaled bubbles. This bizarre, shapeless animal assumes a constantly changing countenance: the tentacles are so alive and mobile that they seem endowed, each one, with a life of their own. Even the suckers move independently of each other, adhering to individual stones with shrewd, measured, very delicate movements. When it opens its arms, the octopus shows its radial structure, but only for a short time before it closes its arms and collects itself. Francesco Turano is an underwater photographer and writer based in the province of Reggio Calabria in southern Italy. He is the author and co-author of several books, including Viaggio in fondo allo Stretto (Journey to the Bottom of the Strait) published by Laruffa Editore; Sott'acqua in Mediterraneo” (Underwater in the Mediterranean) published by SSI; Enciclopedia Illustrata degli Invertebrati Marini (Illustrated Encyclopedia of Marine Invertebrates) published by Arbitrio Editori; and the large photo book with over 250 photographs, Calabria, Mediterraneo sconosciuto (Calabria, the Unknown Mediterranean) published by Iiriti Editor. For more information, visit: francescoturano.it.